Each Burning Man is different. This year I was also a village organizer (see below) and arrived a day before the event opened. 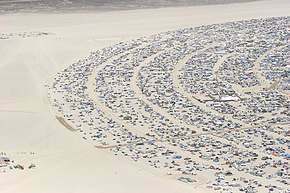 Though already that Sunday it was bigger than many Burning Mans of the past. 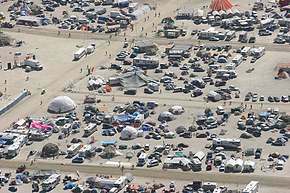 For more information on Burning Man in general, check out my essays of prior years such as 2004 and my Panorama Intro Page and my 2005 Panorama page. This year, in addition to the Panorama Wall and the Phone Booth, I also built an ATM machine which got put on the 7:30 street. The ATM dispensed two types of playa money. This year also featured another shot at a plane ride and some detailed aerial shots of the city. I tried to shoot a detailed closeup of every area of the city so there are over 200 aerial shots! Some need help with labels. 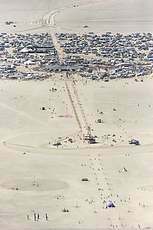 I also got to borrow a boomlift at sunset for some nice panoramas and regular shots both out on the playa and in center camp. 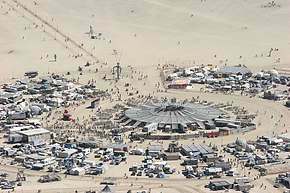 You can read a recent essay on thoughts on the nature of Burning Man. If you're in one of these shots naked and don't want to be, let me know and I'll see if I can find an alternate or blur you. I wasn't always able to get permission on group shots. My new project this year was an ATM. Mounting a toy ATM on a kiosk, I stocked it with special Burning Man money. There were 12 different bills, in two types. The first 6 were regular "Playa Reserve Notes" which in theory you would spend for various ephemeral things like a drink of water or a pleasurable favour or an explanation of an artwork. The other six were "gifting certificates" which were a sort of reverse money. With these, you would give the gifting certificate, and also give the gift written on it. For example, with the drink of water, you would give somebody some water, and the gifting certificate. They now had, in theory, the obligation to give a drink of water to somebody else, along with the certificate, creating a chain of gifting. Lots of people took the money, how many circulated it I don't know. The protest was again a great time, with many people joining us. I also enjoyed the Burn, more focus on fire than on fireworks. Photos again were taken mostly with the new Canon 20D and Canon G5. Most panos shot with my 50mm and 20mm prime lenses. Some were with my new 10-22m super-wide-angle lens designed for the 20D. The Panorama Wall has gotten so big it had to go double sided. That also meant it could not have a deep curve. We tried to make it straight, but that's actually unstable, so it was given a slight curve. People could still see the photos. Fancier lighting was needed. Some of you read my essay on desert power. This year our camp decided to go for a central generator. This costs some money, but it's much more efficient and quieter that the individual generators that were cropping up. Building the power distribution grid for it turned out to be a lot of work. Nobody rents power distribution boxes aimed for plugging RVs into towable generators. We had to build those and faced other problems. The generator we got, a Wisper-Watt, was so quiet you barely knew it was there just 20' away, yet it could do 60kw. Turned out it was a cool year, so we didn't ever use its real capacity, which is bad.